Nothing forces you to be creative like having next to nothing. When you create on demand for a living there’s days where you just want to bang your head against your desk and will a great idea into your brain. But that doesn’t really work. Trust me – I’ve tried it. Many times. All that happens is a bruised forehead – and a headache. So you start to develop little cheats and tricks to get your brain going. And one of my little tricks is to put a limit in place. Like, I can only use the colour blue. Or I can only work with circles. Or I can only doodle flowers. You get the idea. It’s really remarkable how your brain suddenly kicks into gear and starts churning out ideas. I do the same thing with photography when I feel like I’m in a rut and I think it works because it gives the brain a place to focus instead of being overwhelmed by options or directions to go in. Once my brain focuses, things start happening. And I’m much less likely to have a desk banging induced headache! So what is this all about? Well, I recently spent a couple of weeks in Ontario housesitting for a friend. He’s a guy – a single guy with a very active social life. The kitchen, it would seem, is not where he spends much time. His parting words to me as he left for the airport were “eat whatever you want, the emptier the fridge when you leave, the better – and turn the heat down when you go out for the day.” (I swear he was channeling my dad). The fridge was actually in pretty good shape – he’s a fitness buff and so there was a decent amount of fresh veg and fruit and eggs. And some crazy delicious bacon. And some frozen pizza. Some salad dressing. Feta cheese. And several kinds of pickles. I assumed, and wrongly so, that the pantry would be in pretty good shape because… well… that’s just what I’m used to when I visit or housesit for friends. And so on my first trip to the grocery store, in frigid Ontario deep freeze weather (with no car – just my two little feet to carry me), all I bought was chicken, grape tomatoes, garlic and then some oranges and yogurt for breakfast. It was when I got home and started combing through his cupboards to make some dinner that I realized I had seriously underestimated the pantry situation. All the things I take for granted, like flour, milk, a decent spice rack, chicken stock, grains of any kind, vinegar etc were missing. And there was no way I was going back outside to the grocery store at 8pm. I’m from Vancouver. I can’t handle that kind of cold more than once in a single day. I was going to have to get seriously creative! 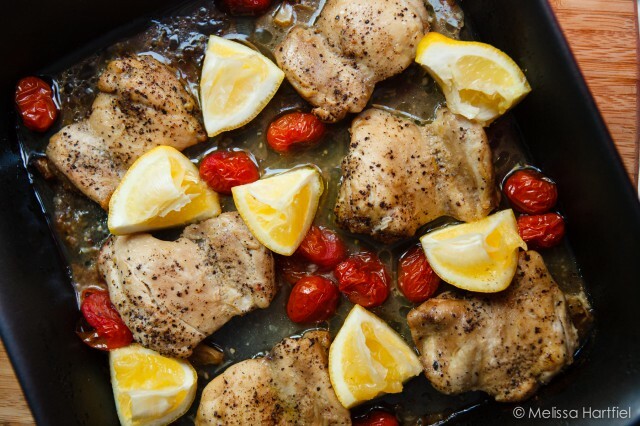 I have a great standard recipe from the kitchn that I use for baking chicken thighs, which is what I had planned to make. It’s a seriously no fail recipe. And given the state of the pantry, which DID have salt and pepper and about 1/4 cup of sunflower oil left in the container, I could make it plain. But I didn’t want plain. I wanted to marinade it and have some juice because… I had also been left one container of my friend’s mom’s homemade noodles to eat and those were not going to waste. So I set to work. There were lemons in the fridge, I found some tiny jar of very fancy honey and a really big container of fancy mustard and I had bought garlic. And I made a really simple marinade of oil, lemon juice and zest, honey, mustard, garlic and salt and pepper. I didn’t have measuring spoons so I totally winged it! Tossed everything in a baking dish and popped it in the oven and half way through, I added in the leftover lemon wedges and the grape tomatoes. It was amazing. It was so good that I’ve made it twice since. Including one time at home where I measured out quantities so I could blog it. 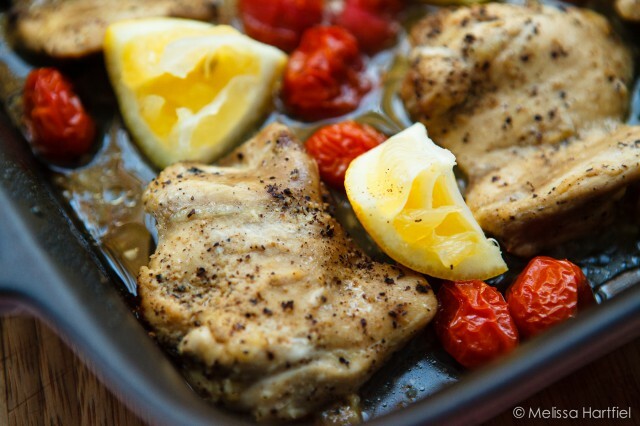 Pour the marinade over the chicken and let it sit in the fridge for 30 minutes or while the oven is heating up. Bake for another 10 minutes or until the chicken reaches an internal temp of 165F. And I think next time I visit my friend, I will bring him a nice kitchen knife and a decent cutting board! This looks as amazing as it sounds Melissa. I have some thighs in the freezer, this is happening!!! You definitely won pantry wars here – this looks great. I adore this post. For a number of reasons. I am currently in a creative slump, recipes generally come hard and fast, but my river of creativity has been dammed some how. I probably have a pesky beaver building it’s home un stream on my creativity river. I house sit at least once a month for a friend somewhere and love the adventure of creating from the most oddball things. 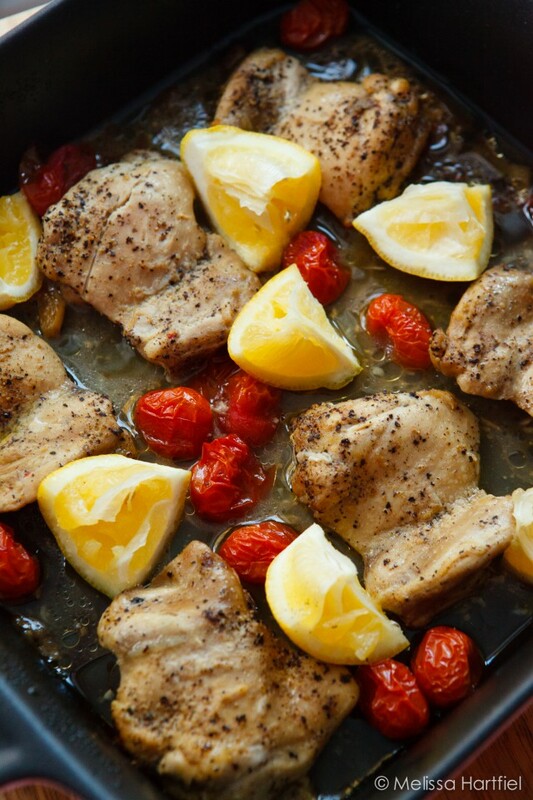 Amazing pictures, and if I can find chicken thighs in my freezer, i”m making this tonight!! Thank you!